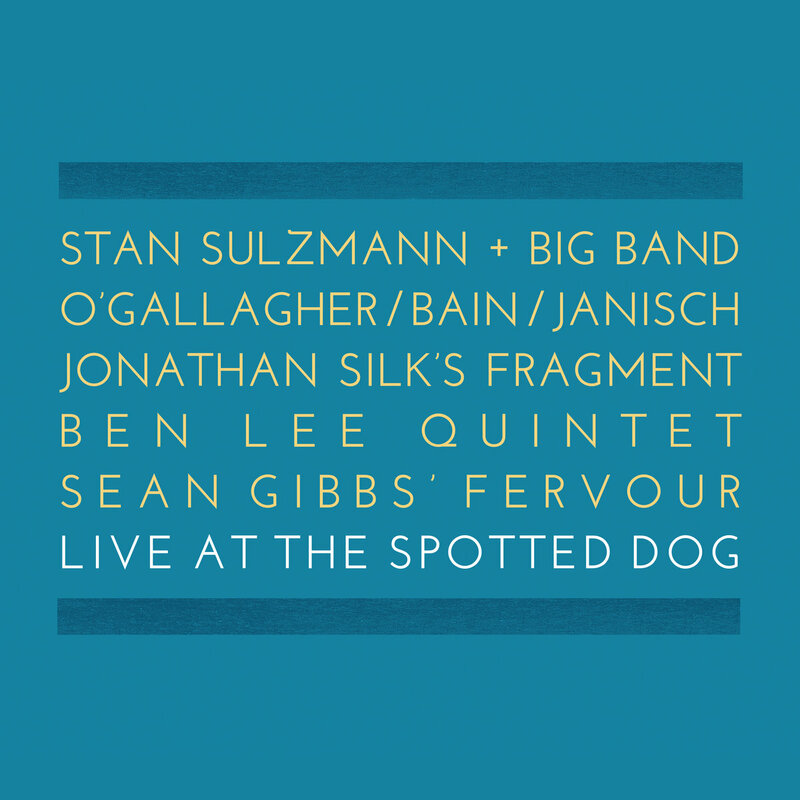 This collection of new music recorded live at The Spotted Dog in Birmingham gives a fascinating and tantalising glimpse into the second city’s thriving jazz scene and its up-and-coming stars. The Spotted Dog has been home to weekly Tuesday jazz sessions which allow the local talent, particularly those springing from the Birmingham Conservatoire, space to present new music late into the night. Founded by saxophonist Mike Fletcher with Miriam Pau and then continued by Jonathan Silk, Richard Foote, Dave Ferris, Sean Gibbs and Chris Young, the pub in a formerly industrial area off Digbeth brings an intimate connection between musicians and audience. This collection was recorded over three nights in 2016, and presents a real treasure trove of musical collaboration. 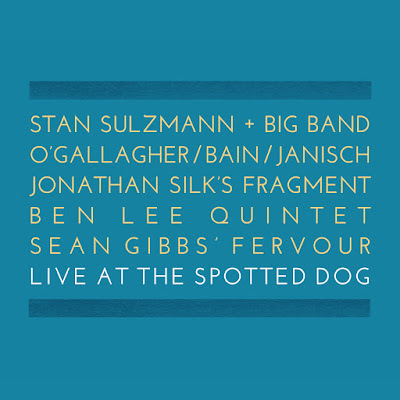 The album leads - both on the sleeve and on the disk - with three tracks from Stan Sulzmann and a big band of Birmingham Conservatoire graduates plus a few regular associates. Of course it’s all very well played, Sulzmann is on good form on tenor saxophone and there is a particularly nice solo from trumpeter Tom Walsh on the ECM-ish The Thrill Is Gone. However, this is far from the main attraction of this collection – it serves more like an hors d’oeuvre for the four outstanding smaller groups who come later. First up is an extraordinary trio led by Scots-born drummer Andrew Bain and featuring Americans alto saxophonist John O’Gallagher and double bassist (and 2016 MOBO award nominee) Michael Janisch. Both Bain and O’Gallagher have been studying for jazz-based PhDs at the Conservatoire, and they clearly know a thing or two about how to put together top-class music making the most of this rather sparse line-up. O’Gallagher combines boppish virtuosity with bluesy, rootsy intensity and an expressive tonal palette to conjure up sustained solos on both his own Extralogical Railman and Janisch’s The JJ I Know. Janisch himself participates with huge concentration and interaction, his bass sounding warm and full even in this relatively informal live recording. Bain - allegedly the leader here but never taking more than his share of the spotlight - is right in there too, and the 20 minutes of music flies by in a heartbeat. If these three made a full CD, I’d play it till it wore out. Jonathan Silk’s Fragment ensemble takes that unusual move of putting a string quartet - two violins, viola and cello - alongside a jazz quartet. First Light starts with the strings to the fore, before Percy Pursglove’s trumpet takes a splendidly fluid solo. The Ben Lee Quintet takes a more energetic route, having the instrumentation of an organ trio (Dave Ferris on organ holding down the bassline, Lee on guitar and Euan Palmer on drums) combined with a juicy front line of alto sax (Chris Young) and the trombone of Richard Foote. The quintet make great use of the range of the alto/trombone combination to give some rich harmony lead lines on Beginning Of The End before Young’s full-on growling solo. Talk To You starts with a heavy Hendrixy riff which ebbs and flows through the number, giving Lee a fine opportunity to show delicacy as well as power in his soloing. Although this is a live album, the applause at the end of the performances has mainly been edited out. This helps with building the collection as a sustained listen and it’s easy to forget the context - until the last number starts with Sean Gibbs addressing the audience and introducing his Fervour quintet to appreciative applause. Cheer Up Old Bean gives an upbeat bouncing conclusion to the album with Andy Bunting’s Rhodes piano and Gibbs' trumpet loping along over the confident bass of Nick Jurd. With very comprehensive sleeve notes from Tony Dudley-Evans (who has played a leading role in Birmingham’s jazz scene for well over 30 years), this is a fine showcase for both the city’s musicians and the output of the Stoney Lane label. LINK: To the album on Stoney Lane’s website, where one track can be previewed before release of the full collection on 26 January 2018.